"Whenever you're here, Laura, I feel like we're all a lot smarter." The map of a rapid design studio + user testing for agile UX. ﻿Some of the most fascinating undertakings on earth are to be found in the lifecycle of user experience research, test, and evaluation. UX research opens the door to matching methods with questions, meeting real people across the world and range of experience, and finding meaning in the most subtle and detailed collections of data. My UX research experiences are 20 years deep, supported by practical training, degrees in anthropology and psychology, and hands-on work from enterprise to UI to backend architecture. See some of the fun, below! Everyone should work in a startup at least once in their lives! The "get in there and get it done" experience I had at AWARE Software called out every hands-on capability I ever had, and drove me to gain more and invent where there was nothing before. The energy of a cross-disciplinary team of self-starters, armed with folding tables, powerful laptops, and an espresso machine, brought to life a unique tool where before had been an idea, and a starter seed of code and approach. 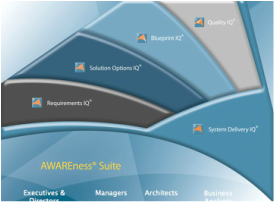 The AWAREness Suite™ and process is an enterprise lifecycle tool that mapped an entire semi-conductor fabrication facility. I lead and hands-on performed the full user experience lifecycle effort. Ultimately, there is no substitute for great UX process. USAA is a financial services corporation with a mission. Its dedication to its members' experience and daily lives is unparalleled in the industry. To that end, it houses a premier user experience research team, leading and partnering to deliver both rapid and in-depth results. During more than two years of service on that team, I planned, conducted, analyzed, and reported results and recommended design solutions for more than sixty studies per year. Our studies locales ranged from full-services UX labs, to climbing around rural homeowners' properties to identify fire hazards. Independently and as partners and teammates we put nearly every method in the UX toolkit to good use, reporting weekly directly to executive and decision-makers. High in the Mojave Desert is the U.S. Army National Training Center one of the largest, most versatile centers of its kind. Over a period of months, I applied in-depth anthropological methods to study the "Star Wars" data operations. Staff there were accustomed to being "in a fishbowl" with visitors over their shoulders, rushing by with their agenda-driven questions. 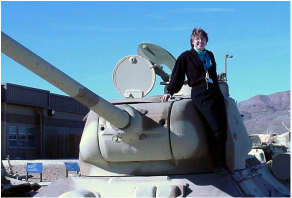 They didn't quite know what to do with the contrast of a quiet woman on the sidelines, arriving when they did at the start of midnight battles, watching and learning, then joining them in the grueling ferrying of daily debriefs across the desert, well after noon the next day. The ethnographic products I created were actively used as a core tool for R&D software teams to build empathy and understand operations for more than a decade.